Michael grinned despite their problems. His memory troubles aside, Felix was, at least, still Felix. Only a few days had passed since the experience on the Moon that linked Felix’s memory implant to Gideon’s memory. Though the procedure appeared to have saved Gideon, after a period of unconsciousness Felix had woken completely unable to remember the previous two hours, and with holes in his recollection of the time before that. The sirens, whatever their source, were growing nearer. “How often do you get that implant checked?” Michael asked. “He had his last one perhaps a week and a half ago,” Caitlin added. “To bring Gideon back from the dead,” Caitlin added. It wasn’t like Michael could do anything else. He wasn’t a scientist. The sum of Gideon’s memories made Gideon the man he was. If Felix’s implant failed and somehow took Felix’s own memories with it, what would happen to the friend that Michael knew? No one spoke. Michael wondered if Caitlin sensed the same lack of conviction in her boyfriend’s voice that he did. Moments later, the taxi pulled up to the curb in front of the Aria Building. Thirty stories of blue steel and glass towered above a dais of concrete, landscaped with shrubs and sapling maples whose wilt spoke of better days. Sure enough, Northgate’s Corporate Mercy Hospital sat across the street in the Aria’s shadow. The two nodded and then trotted up the sidewalk that stretched along the landscaped section, toward the stairs that led up to the building’s entrance. It was the same direction from which the sirens were approaching. They did sound different from ambulance sirens. Michael finished paying the driver, turned to follow his friends, and then realized the reason for the difference. A silver convertible tore around the street corner ahead. Tires screeched and metal slammed into metal as two other cars swerved out of its way, only to collide with each other instead. Gunfire exploded from an assault rifle braced on the convertible’s driver’s side door. Bullets shattered windows and pedestrians alike. In the convertible’s wake followed the flashing blue and violet lights of two red and black CPMC response cruisers. With CPMC involved, the convertible’s driver had likely gone full-bore CP: an explosion of irrational, psychopathic violence, borne of cybernetic overload that would not stop until he burned himself out or CPMC put him down. Cybernetic Psychoses Monitoring and Control: that was their job. Michael had witnessed a CPMC response team’s ruthless efficiency once before. They would stop the driver, yes, but would it be fast enough? Michael yelled a warning to Caitlin and Felix and dashed toward them into danger. Caitlin dragged Felix into the cover of the landscaped section just off the sidewalk. The two hunkered down with a few others against the concrete wall between them and the steps of the Aria Building. Michael’s shoes pounded the pavement as he closed the distance. A handful of the corporate freelancers guarding the building—contracted Aegis Security, by their uniforms—had already dashed out of its front doors to take up positions atop the stairs. The convertible plunged down the street, only moments away. The driver fired another burst from the rifle into an oncoming car and then swerved left to avoid another. Tires squealed and people scattered as the convertible launched up the Aria Building’s front steps. It got halfway to the doors before screeching to a metal-mangling stop against the steel railing that ran up the center. An airbag burst into the driver’s face, and augmented arms ripped it to shreds a moment later. The driver’s eyes blazed. Curses erupted from his lungs. Michael reached his friends and hunkered down beside them. “I remember what those sirens are for now!” Felix shouted. Michael risked a look over the edge of the wall. The CPMC cruisers rushed to a stop on the curb below the stairs. Two officers in black and red armor scrambled out and dropped into defensive positions behind each cruiser. The convertible driver screamed again and fired toward them in a spasm of bullets that either punched into the cruisers or went wide. Screams of passersby rained through it all. Michael felt a hand on his shoulder—Caitlin or Felix, he couldn’t be sure and didn’t spare time to look. His eyes were drawn to a man lying on the steps about ten feet from the convertible, directly between the car and Michael’s position. The man had thrown his arms around his head. His entire body quaked. Michael waved at him in an effort to coax him to cover without attracting the driver’s attention, but the man’s eyes remained clenched. The driver bellowed again and kicked the car door open. Already damaged in the crash, it flung outward, now more than half torn off of its hinges. The driver hunkered down further and sprayed another burst from his rifle over the dashboard. Michael couldn’t tell if he hit anyone. Behind their cruisers, the CPMC fired back. Bullets impacted the convertible’s engine block; it was suppressive fire only, buying time for two of the officers to ready the specialized weapons that CPMC squads carried to end such confrontations. The man on the steps began to shriek. Arms still over his head, eyes still clenched, he tried to scramble away from the convertible, hindered by his own panic. Michael drew the FN Panther 9mm auto-pistol he carried aimed at the raging cyborg driver. The Panther wasn’t likely powerful enough to do more than piss him off, but they’d arrived straight from the airport; it was the only weapon Michael had. The Aegis freelancers merely waited atop the stairs—guarding the building’s entrance only—and Michael had to do something. The man on the steps hollered and stopped his feeble scramble, quaking further and trying to see through clenched eyelids from where the gunfire had come. Michael’s shots had no other effect. He might have hit the cyborg’s arm, or maybe the body armor that wrapped his torso. He couldn’t tell. Using just the Panther, only a headshot might stop the cyborg, and Michael didn’t have a clear shot. Blood pounded in his ears. He forced himself to stay down. One CPMC officer hefted on his shoulder what Michael could only describe as a cannon and took aim at the convertible. Beside Michael, Felix risked a look. “Felix, get down!” Caitlin grabbed him and pulled him back. Two things happened at once: the officer fired and the driver sprang out of the car, rifle in hand, firing back. The cannon’s projectile hit the driver’s seat and flared in a tiny burst of electricity: an EMP blast to knock out the man’s cyberware. Michael winced. If the EMP hit Felix, what would happen to his memory implant? But it was a short-range burst, not even enough to affect the cyborg once he’d escaped the car. The driver’s rifle clicked empty. He came to a stop directly between the panicked man on the steps and the CPMC officers who now held their fire. The entire scene seemed to freeze. Two of the officers sprang from cover, wielding stun rods. The cyborg hurled his empty rifle at one of them. It smacked into the officer’s helmet and knocked him to the ground as the cyborg tore the car door from what remained of its hinges, yelling with pain from the effort. The second officer dashed up the steps, nearly within reach, but not fast enough. The cyborg flung the door into his chest, and the officer tumbled back down the steps in a heap. The man froze, his eyes wide. He reached one hand behind him, clawing at the step, as if it alone could drag the rest of him away to safety. He was thin, in his forties, and seemed half the cyborg’s size. He wore coveralls, perhaps a painter or a plumber on a break from a job in the building. He should have been safe in the Corporate District, instead of facing the raging terror that stared him down. Atop the steps, the Aegis freelancers held position. The cyborg was too close to the other man for Michael to get a clean shot. Michael’s legs tensed. At once the cyborg rushed the cowering man to haul him off the steps in a single, screaming motion. With a shout to Felix and Caitlin of “Stay here!” Michael clambered over the wall and into the open. The cyborg shoved the man into the steps’ mangled railing. He was drawing him back for another blow when Michael grabbed the cyborg’s arms and yanked for all he was worth to stop him. The cyborg slammed his forehead into Michael’s. His vision swam from the impact. For a split second Michael met the gaze of the cyborg’s other victim, as the man freed himself and scrambled back. A split second was all Michael’s opponent gave him. Something huge slammed against Michael’s back before he realized he’d been shoved against the side of the convertible. The cyborg held him by the shoulders. Bloodshot eyes blazed. Screams soaked in alcohol flared into Michael’s face. He rammed Michael back against the car again and again. Michael grappled with the cyborg’s arms, trying to get a grip, trying to pull himself free, and failing every time to beat the other’s strength. Lights danced in his vision each time his skull battered into the car. Stop! Stop! Lights danced again, brighter. The cyborg stopped with a ragged gasp. Again the lights flared. Jolts tingled across Michael’s skin and muscles. The cyborg released him. They both dropped to the steps. They’d hit his attacker with another blast, on-target this time. Michael struggled to catch his breath as the other’s leg twitched and arms lay powerless. Three CPMC officers dashed in to ram stun rods against the cyborg’s back to further subdue him. Michael crawled away as best he could, trying to get out of their way and still reeling from his bludgeoning against the car. Sirens continued, now from the ambulances that issued from the hospital across the street. The man Michael had rescued half-sat, half-lay at the edge of the steps, breathing hard. Michael pulled himself to his feet and made his way over. The man’s jaw was clenched. Both arms were locked across his chest. He stretched one of them out to wave Michael off, but he nodded to the question nonetheless. Michael turned to call for some help, but people lay shot or otherwise injured all along the maniac’s path. First responders would have their hands full with more serious cases already. He turned back to the man. He could help him across the street to the hospital himself, but for the moment the man didn’t appear ready to go anywhere. The CPMC officers had already detached the cyborg’s arms and were working at removing his leg. Even having seen the process once before, the speed at which they completed the task amazed Michael. The cyborg himself was unconscious. He hadn’t seen how they’d managed it. Three of the officers appeared okay. The fourth, hit by the car door, remained where he’d fallen but was moving a little. At least he was alive. Michael turned back to the man on the steps, unsure of what, if anything, to say. Instead, he said nothing and sat a few feet away. It didn’t feel right to just abandon the man before help arrived. Caitlin and Felix were already on their way up the steps. Michael greeted them with a wave. “Are you alright?” Caitlin asked. The man to his left shivered. Michael nodded. “Better me than you.” Felix’s eyes and ears were both artificial. Even without the memory implant he had a lot to lose. There were ways to shield against EMP, but Michael didn’t know how common they were. “Is your implant shielded at all?” He had also heard at some point about how EMP was less effective on a tiny, nano-molecular level, but he couldn’t be sure if that even applied to Felix’s situation. Caitlin gave Felix’s arm a tug and led him to the entrance. Michael sighed and watched things unfold. Arriving units from the Corporate District security force—also run by Aegis—busied themselves with cordoning off the area. They admitted the ambulances that came from elsewhere to augment the medical staff that now dashed like ants between the hospital and the wounded on the sidewalk. CPMC loaded the man responsible into the back of one cruiser. He remained unconscious, with three of his limbs now out of sight. The man beside Michael was watching CPMC, too. Michael decided to watch over him for a while, offer to see him to help again in a bit, and then maybe see about himself. How long would Felix be in Horizon? Would they be able to help at all? Michael thought to call Marc and give him an update on Felix, realizing anew that his phone would be fried. Marc had wanted to come with them when they got back to Earth, but the European Space Administration likely still hunted for him. The Agents of Aeneas had decided to reroute Marc to an AoA facility, so as to send him back to the Moon as soon as possible. Now that the AoA controlled Paragon, Marc would be part of the team to plumb its secrets. Michael reached into his pocket for the keycard to Marc’s apartment, remembering his promise to send on some equipment Marc had asked for and check on “Holes,” the artificial intelligence Marc had created. 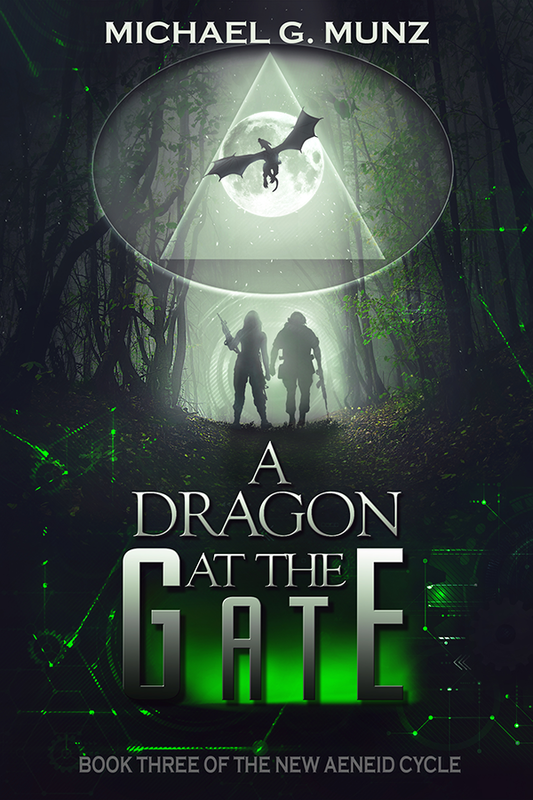 The keycard was still there, as was something else: a mysterious pen-sized object, which Diomedes had pushed into Michael’s hands just before he died. The man glanced at it but gave no other response. Michael gasped. It was as if an invisible spear had punched through his chest. At once, he couldn’t draw breath. Pain radiated down his left arm and up his neck. His knees buckled, he clutched at his heart, and the steps tumbled up to meet him. Thanks for reading! If you enjoyed it, please share this post. 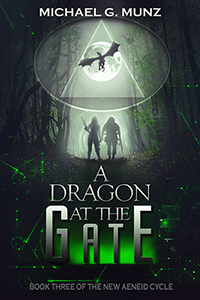 And don’t forget to pre-order your copy of A Dragon at the Gate, coming to paperback and ebook on August 17th!